How was the knee on your 6 miler? Your workouts are definitely well thought out, k. I hope the knee falls in line and cooperates with the rest of your training. We're definitely heading to Ludington August 10th arrival and leaving Friday, the 15th. We'll be camping at Cartier Campground off Lakeshore right by the Lincoln River. Our friends, the Johnstons - the couple we went to Florida with, are coming with us. I wish I could make it to the Seaway race. Lots of RA peeps gonna be there I see. We'll be leaving for Gatlinburg, TN that day though. You can have a post race Oberon for me... I'll be there in spirit for y'all! I have a funny feeling that we are going to enable each other in the 'gadget and gizmo' department. Our wallets will be screaming at us! LOL! You'll have to let me know how you like the iPod shuffle. I'm running with a 3rd gen. nano right now. It's nice, but I would love to get it 'off' my arm. Something tiny that could fit in the runningskirt pocket would be a dream. SIde note: my word verification thingie for this reply is ZOMYBE... think they were trying to right ZOOMY??? LOL! Rick, I should come up and run with you and Tammy when you guys are in Ludington. That's only a 45 minute drive away from me. Sherry, that verification word is hilarious...if it's not Zoomy, maybe Zombie? That's how I've felt the last couple of days, heh! Don't know if I'll be running yet, but I could peddly along. We could even meet somewhere in the middle. 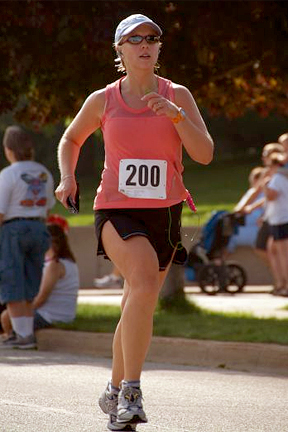 Dianna (Johnston) is a runner as well. She's the one that ran the 25K in GR. We'll definitely have to get together, even for dinner or something, that week.